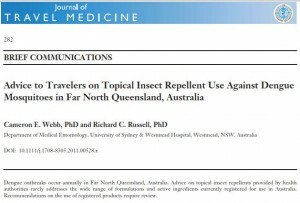 While these botanical repellents may only offer limited protection times, a product registered in Australia as ‘extract of lemon eucalyptus, being acidmodified oil of lemon eucalyptus (Corymbia citriodora)’ [Mosiguard] has been shown to provide effective protection against a range of biting insects. This product is not actually the extract from the plant but a by-product of the hydrodistillation process known as p-menthane-3, 8-diol (PMD). 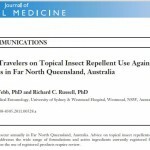 This is the first plant-derived repellent to be included in public health messages issued by the Centers for Disease Control (CDC) in North America.